at Freshly Brewed Challenges. If you are getting here from Jessica's blog then you are right on track! The card I created for you features the FBD Rubber Stamp I'll take mine to go. She's taking a trip to a friends house.... ummm wonder who that friend could be? Your NEXT stop is at Vanessa's Blog. I love that you personalized this fun creation! She is a fun image and you used such great embellishments and papers - gives me some great ideas. Happy Blog Hop day - how fun we are on the same blog hop together - I always love seeing what you create. What a cute card! Love the papers you used! What a terrific idea for this image. It is so clever and cute. Great job on your adorable card! Love the map background and the bottle cap embellie!!!! Hi Joanie! I love how you used this stamp to create a TRAVEL CARD! How very special! I love your coloring! GORGEOUS! What a treat to hop with you! Oh I love this stamp and paper. I own both so I'm gonna have to try this one!! Love it! A great travel card...great for a visit to a special friend! Like the image & papers used. The bottle cap is a wonderful added embellishment. What a great card-- I adore the paper that you used--a perfect theme for this stamp! Love it! What a fabulous card!!!! 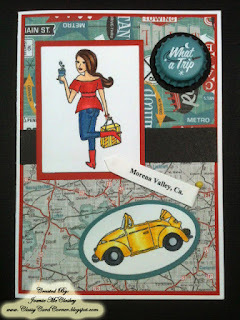 I adore the papers you used for the travel theme! She has her coffee and is ready for a long trip! Gorgeous. Thanks for joining us on our hop! This is a great card!! I love it!! Glad to be on the hop with you! 'I'll take mine to go' is one of my favorite FBD Stamps and when I was on the team with Heather, she was my avatar for my badge, so I am a fan of all things "mine to go" girl!! Love what you've done with the map and the way she's colored!! Thank you for being part of this hop!! Love your card. Very cute. TFS. Super cute card! I love the design! Hi Joanie! What an awesome card! I just love all the vibrant colors. I was snooping through your blog and I must say, You've done some beautiful work! Love the "Fight Like a Girl" card. too! Thanks Cissy for the very nice compliment, I hope you come back often to visit. What an adorable card. I love the way you "mapped" it out! TFS! i love all the unique to the theme backgrounds you used for the card. It's adorable! Thanks for sharing. I love your card! Great coloring!! This card reminds me of myself. Always ready to go! Hope I will learn o do all this. I'm a newbie!